On Friday, 10th of July, 2015 I received an interesting email from one of first time visitor’s to my site. I get a lot of emails everyday of stories of mistakes done while trading, but this one stands out as this person kept on repeating his mistakes in an act of revenge to get back his lost money from the stock markets. Too see the end result you will have to read his investing and trading story. In the end I have something to say. Please read that as well. I have also added my observations in between in round brackets to make it an interesting read. I had 720 equity shares of L&T – after split they became 1080. I had other shares as well – 500 of HUL, 302 of Yes Bank, 300 of Bharti Airtel, and 100 of HDIL. Then one day in August 2013, my broker called from a mobile phone number and said that some trades had wrongly happened in my account and they will be corrected tomorrow, without disclosing much details. I did not have an idea as to the extent it would be. He also requested me to confirm at 3.30 pm that I have been informed. At 3.30 pm, I got a confirmation call and without suspecting anything fishy, I mentioned that a representative had called and informed me. Next day was 15th August, I called the guy who called from his mobile and asked him about what had exactly happened. He informed that rectification would be done the next day when markets open – but did not give any explicit information. Next morning he called me again from his mobile phone and told me that the loss has become 4 lakhs, I asked him which loss? He replied that the positions were carried forward. He asked me if I want him to square of my positions. I told him that just stop this. He then visited my office personally and assured me that he would settle my account within a week. I waited for a week and nothing happened. I mailed the compliance but there was no reply. Then I visited the broker myself and they managed to instill fear in me to a point where I thought as if I myself had done some mistake. They told me that the only way I could recover the loss is by trading under their guidance. Here is where I committed my biggest mistake. They then made me buy Nifty 800 qty, and it fell by 60 points to extend my loss by Rs. 48,000. I committed another mistake post this. I got the software installed and started trading myself. Till 2 weeks back,I was not aware that a thing called trading exists (In hindsight, at times ignorance is bliss), and here I was without a clue indulging in trading and putting at stake such a huge amount. 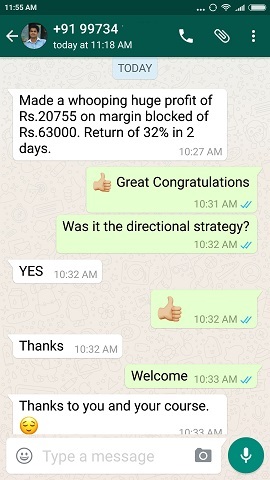 My equity holding before this loss was 18 lakhs, but besides the loss of 4.48 lakhs plus brokerage, the shares had also corrected by more than 12 percent which made my account shrink to around 11 lakhs. I felt a lot of pressure. Then, I traded myself like a mad man aggressively. And in 3 successive days, just by shorting Reliance Communications, I earned 195,000. I thought I could cover this loss of 4.48 lakhs myself. Then, I simply thought shorting was the way and blindly shorted everything that had increased substantially in the last few weeks. I also shorted Tata Steel and Tech Mahindra and lost a further 2 lakhs. My loss had only compounded. And finally I discussed it with friends who advised me to file a complaint with SEBI against yyy securities. I did so, but at the arbitration as well everything went against me. From acknowledging trades to continuing trading with them, I had no other option. In frustration, I sold of all my equity holdings in Feb 2014, just before the Modi Bull run was about to gain momentum, and made a net loss of 11.20 lakhs and exited the stock market. I wish I had stopped there. Then, on the day Modi became the PM, after taking a 3 month break and missing a major bull run, the value of my equity holdings itself would have increased by around 46%. So, I began another unplanned madness journey with a small amount with another broker. On an investment of 1 lakh, I earned Rs. 42,000 in a month. I would however in this as well, add money in my trading account whenever I needed to average and then withdraw money after exiting the position. But, I had to get trapped and I bought GMR infra in July and averaged it at very short gaps and had 150,000 quantity. Had go deposit 12 lakhs to hold in. It simultaneously came in F&O Ban. I asked the broker, what can be done in a ban to lower my average? He said you can only wait for the ban to be lifted. I waited till it came to Rs. 5 below my bought price. Finally, I exited at a loss of around 6.3 lakhs. Here, one lack of information increased my loss. I wasn’t aware that in ban period I could do intraday trades. I made a fresh loss of 6.3 lakhs, taking my net loss to 17.5 lakhs. But bad habits die hard, I came back in April and in May again indulged in trading, setting rules for myself. 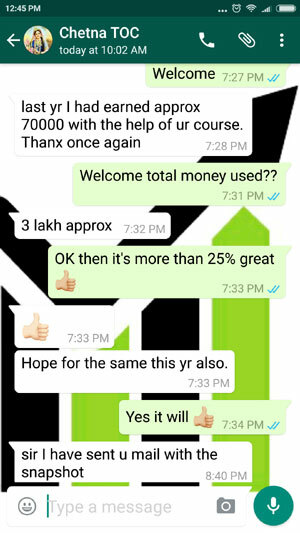 I invested 2 lakhs, and in a month it increased by 1.3 lakhs. It looked as if this is going to be my time. Then ,on June 2 this year, I carried forward 5 lots of JP Associates. Next morning when it fell, I deposited another 4 lakhs and added another 24 lots, making it 29 lots. I asked the RM (relationship manager) at the broker firm to inform me about any margin requirements. He said he will do so. But he had a family emergency and left without any Information. I also could not track the price. Then, it fell by 35% on that day, and all my money 7.3 lakhs was washed off without intimidating me, though I had the funds. It recovered within a day to reach just 20 paise short of my average price the very next day. I traded further and put all my balance of 20 lakhs to avoid such a situation. This time magically, within 3 days,I recovered 2.3 lakhs. Making my net loss to 5 lakhs. Desperation to cover this quickly set in, which is an enough ingredient for suicide in stock market. I shorted Dish TV blindly at a gap of just 50 paise and had 76,000 qty (19 lots short) at an average of 102.5. I held it on for a week, hoping it will come down. It lingered around 107 for 5 days and suddenly it spiked to 117 in one day. I was loosing 11 lakhs in this trade alone and the broker advised me to square it off, saying it will rise further. I did not hedge it either. Eventually, when it came to 113.10, I squared off all. In hindsight, a maniac behavior. I lost 8 lakhs in this trade alone, only to see it drop to 101 in two days. I just couldn’t believe what had happened. After booking, it sinks in a lot more than while being in loss open ended. After gaining 10-15,000 everyday for a week, I again traded aggressively. Ashok Leyland, this time being the stock I shorted 48,000 at an average of 72.2 and booked loss when it reached 75.10 (the Dish TV phobia prompting to cover it at at loss of 140,000). I again saw it come to 71 in a couple of days. I filed a complaint with NSE regarding the squaring off positions of JP on June 3 by the broker. The broker requested me to take back my complaint and was ready for a reconciliation. Though, the loss suffered was 7.3 lakhs, and this time I had denied the trades in the confirmation call, the maximum offer I got was 1 lakh rupees from them or continue with the case. I decided to take whatever was being given and just trade with this amount. I took this money and gave them a resolution letter. With this amount, as a final thing, in this week I lost 60,000 again buying Vedanta. I again exited prematurely. I have a savings left of 11.5 lakhs. Having lost 30.5 lakhs in total in irrational and suicidal trading. To add salt to wounds, L&T, HUL, Bharti Airtel,Yes Bank closed to their highs. Today, I would have had 12 lakhs more from my initial equity holdings had they been in place. So besides the 30.5 lakhs loss, and from the price I sold my equity holdings in Feb 2014, I would have had a total savings including equity holdings of an additional 19 lakhs. Had that unauthorized trade by the broker yyy in 2013 not happened, I would have had a savings of nearly 60 lakhs plus interest on it. Had I not indulged in trading myself, I could have maximum lost the 4 lakhs that they initially lost for me. Still 56 lakhs plus interest on it would have meant a saving of nearly 65-66 lakhs. I am 29 now and had worked hard and done well for myself since turning 21 and saving that amount till I was 27. But that day in August 2013, changed the course of my life in a big way. It’s primarily the huge risks that I took, which is responsible for where I am, but the broker firm has played its part. That loss of 4 lakhs was a trigger for me, and I know that had that not happened, I never had the need to trade. But more than that, what I did post that has done the maximum damage. But the pain of doing this stupidity thrice hurts, and the thought of what could have been had I exited at various stages, had I not re-entered, had I done it a little rationally. With this 11.5 lakhs of savings, I have done an FD of 10 lakhs. I am alone and not planning to work for the time being. (WHY?) After a loss of this magnitude, the feeling of having lost what’s being earned with hard work in 6-7 years being wiped out and then working another 4-5 years to get back to where I could have been, doesn’t seem worth it at this stage. Perhaps, time will give more clarity. Thank you for your platform for sharing. I have not mentioned my name, but can speak to you if you can email me your number. Haven’t checked this page for your contact details. 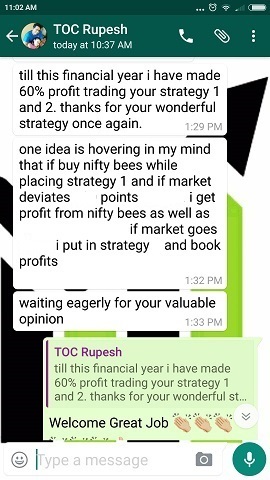 Thank you Mr. Shivashambho for sharing your trading journey. It will help a lot of people reading this not to get into irrational trading. My advice: Not just stock trading, learn from any mistake you do in your life. Everyday is a learning experience – you don’t stop learning when you are 60 just because you have retired. People who have stopped learning are as good as dead. Why do you think in most companies people who constantly learn and work hard are the ones who keep getting promotions? Others may just crib, but the fact is you get what you deserve. Stock trading is also a business where people who plan, go slow, who have the knowledge will almost always survive. Those who do irrational trading and speculation just because they want to make money will lose money and wither away. My only objective to post his email as a post was that if you are in the middle of something like this then please STOP NOW. You may end up being even worse than what you just read. Please then do not blame your luck, broker or SEBI or even God. And please do not fear the stock markets either. On a ten year scale the stock markets will return more than any other investment vehicle in this world including real state or gold. Yes there is risk, but if you learn to manage risk there is a lot of money to be made. Just plan your trading well. Please share your story. You can contact me or just write in the comments section of this post. Thanks for reading such a long post. Alas,, Shocking story…i think that guy is well educated. but why didnt he tried a technical trading or stock investing books before he jump with blindfolded? its GREED. Thanks to you and shivasambho for sharing this heart bleeding story sir. i got a lesson from this. NEVER EVER GREEDY. 6. High paying job – so even if he losses 10 lakhs in the back of his mind he thought that he will make up for it in a few months. Yes the biggest problem was greed and he now accepts that he paid a price for it. Frankly nothing is lost. He can still rise from the ashes – the will and patience is required. Right now it seems he lacks it but I am sure with time he will change. I think a whole lot of us have gone through this…maybe not on such a huge scale…but yes we have done that, been there. Trading without knowledge, is gambling, which is exactly what happened here. I can only say…there is a world of knowledge to be learnt from the market…technical, fundamental, anything…be a student….respect the markets…and learn and earn. Yes Shantanu, me too but not to this scale. I lost everything I had – in fact had to take a loan to survive. At least this guy still has some cash left and no family to bother. By scale I mean the way he did. I rarely repeated the mistake I did once, but he kept on repeating – that’s where he crossed the line. He could have at least reduced the size significantly. But repeating the same mistake and increasing the lot size is baffling. Rightly said by him – he was on a financial suicide mission. Very True – be a student, respect the markets – learn and earn. this article is good. highlighting all the mistakes a common trader does. Keep it up. Srinivas, yes that is the reason why I posted this on the site. Hope traders reading this learn from it and avoid these mistakes. What happens if our broker does some wrong trade during call n trade or does some trade in your trading account without our permission. How can we protect our capital residing in our trading account like zerodha? Ashish, I will write a detailed article on this. In India SEBI has very strict guidelines and has strong control over the actions of brokers and traders. It is highly unlikely that a broker can run away with its traders money. The consequences can be pretty bad for the owner or the owners – so you will not find any news of brokers running away with their traders money. As far as Zerodha is concerned they are one of the best discount brokerage companies in India with a lot of innovative products and services. They are very profitable too. Zerodha is registered with SEBI, BSE, NSE, MCX etc and regularly audited by them. So please do not worry – just like your bank – your money is safe with Zerodha. Thanks Dilip. That answers my question! I wonder how did the broker place the trades for the owner without any permission from him. I m referring to the article in this link. And to my surprise he had to fight with the broker to get the compensation and hence my question on such brokers credibility. Ashish, we have only heard one side of the story. We don’t know exactly what happened. I think they did not explain him the consequences of what might happen or he would have misunderstood or both – we don’t know. So just blaming the broker does not make sense to me unless we have proof they really did something wrong to his account without his knowledge. Further please understand that there was a trade done – the broker cannot and did not run away with his money. Why that trade happened is known better to the broker and the concerned person. Since we do not know the reality we cannot blame anyone. Hope this clears your confusion. For sake of clarity on what happened with the broker. The first instance in Aug 2013, I had a demat account with equity holdings only. While opening the account, I hadn’t observed that F&O trading was also ticked. I did not know about the instrument called F&O trading. What the broker did was, to generate brokerage, he did unauthorized trades but when he called me he did not mention unauthorized trades or anything. He initially called from a mobile and informed that some mistake has happened accidentally meant for some other account and said that around 330, you will get a call from the landline, please confirm. Upon receiving the call from landline, I was told of various trades. Without suspecting, I just said “Haan RM ne bataya hai, kal rectify kar dijiye”. 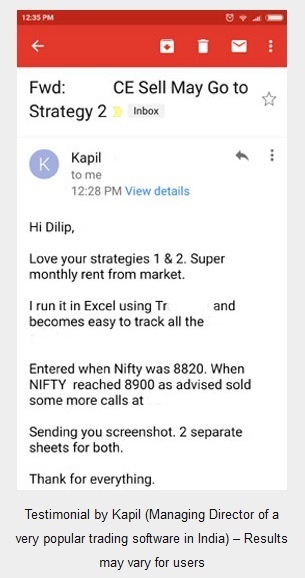 So Dilip ji, since you educate, even at the sake of not naming the broker, it will be appropriate and beneficial if you can also inform readers of various malpractices which the brokers got away with. In my case, I hadn’t done any trading neither had asked them to do so, apart from the KYC letter, which has a pre-written note about F&O trading. For the first loss of 4.48 lakhs, I was deceived. After the confirmation that they took, they just used it and passed the buck on me. In the second recent instance of the JP Associate trades, the RMS had squared off my positions without intimidating me. Even, when I had lost 75% of the capital, I wasn’t informed, though I had the funds and they had previously always informed. They were however a little generous and gave a compensation of 1 lakh for the loss of 7.3 lakhs. The second instance is debatable, but in the first instance it was just a lust to generate brokerage that tempted the RM to do the trades, and calling from mobile to tell me that some mistake has happened accidentally, which was meant for some other account and asking me to confirm yes from the landline, was a trap I fell for. So, please educate about the various strategies adopted by brokers to fool unsuspecting account holders. As a matter of fact, my account in the first mentioned firm was dormant for more than 2 years, with just equity shares held. I even have a recording of the dealer accepting that you were fooled and we had to do this to save ourselves, but it did not prove effective even in front of the arbitrators. Because, though SEBI has stringent policies on paper, it depends on the arbitrator you get. And like in every other field, the broker firm would prefer to bribe the arbitrator for a much lesser amount than paying me the then loss of 4.48 lakhs. Since, I used to work in a media firm, I also did audio sting operations of branch managers of their offices, where they offered various schemes of converting black money to white money. I sent it to NSE, 18 months ago and there has been no response till date. So, as long as you don’t get a first hand experience, you can say that SEBI is strict and the brokers are very rule following. I lost 90% of my money due to my strategies, but I really never was interested in trading. just holding a few blue-chip stocks and adding them on dips was my idea, which I practiced for 3.5 years. But, that trigger was enough. You might have faith in arbitration Dilip, but it is not a clean process, it is highly tilted in favor of the brokers. At least, a clear communication in giving ideas to convert black-money to white money is punishable. Isn’t it? Yours is a very unique and sad story. I get nearly 3 calls on my phone everyday from traders and almost everyone tells me about their trades, life etc. But NO ONE ever said this kind of a thing that the broker traded on their account without their knowledge. Please do not get me wrong – I am not suspecting what you have written here – I am only saying that these are very rare instances which should not happen. One greedy person was your broker and second you. He lost 4.5 lakhs of which you got 1 lakh back – so that makes 3.5 lakhs. Now you end up losing 31 lakhs – that’s almost 10 times of what the broker lost on your behalf. Once the figure reached 10 lakhs you should have pressed the STOP button – but you didn’t and this happened. Assuming that broker returns you 3.5 lakhs that he lost for you – you are still 27 lakhs down on your own mistakes. My point is its time to move forward with a positive attitude. That money is lost and will never come back. But after talking with you and seeing your profile in Wikipedia I can only say that you are highly talented and very young. Making 30 lakhs is a 10 month affair for you. 🙂 So why think too much on this. Now when you get down to trading – do it with all the knowledge possible you can and see how the results will be different this time. But you can do that only with a free mind and no remorse against anyone. Thank you for your inputs and wish you good luck.